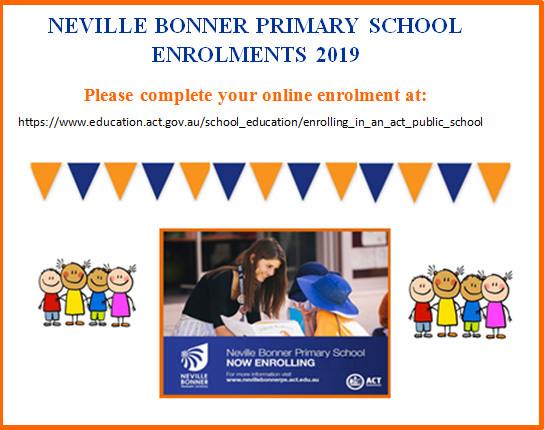 Enrolments for all ACT Public School open on Monday 30 April. Please follow the link below to begin your enrolment. Stationery packs are pre-ordered in bulk by the school. The stationery packs contain all the necessary equipment that children will need for the year, including exercise books, pencils, textas, crayons, display folders etc. Stationery packs also include Reading Eggs (Preschool – Year 6) and Mathletics (Kindergarten – Year 6) subscriptions. Ongoing families – please see Newsletter emailed on 20 December 2018 for payment details. New families – further information and payment/costs will be available in your enrolment packs. Each year at Neville Bonner Primary School, we ask for your valuable support through our voluntary financial contribution programme. These contributions form an important part of our school budget. They assist the school to offer the best possible education and resources for all our students. Voluntary contributions assist us to provide additional equipment, materials, educational games and opportunities for the children’s learning programme. A well-resourced and high-quality education programme is a priority for Neville Bonner Primary School and we thank you in advance for your support. Contributions of smaller or larger amounts, depending on your circumstances, will be gratefully accepted. Please feel free to make your contributions in full or by instalments. Ongoing families – please see Newsletter emailed on 20 December 2018 for contribution details. New families – further information and contribution details will be available in your enrolment packs. Neville Bonner Primary School will again be running playgroup sessions in 2019. Please note that Parents/Carers are required to stay with their children for the entirety of each session attended. If you are interested in joining a 2019 Playgroup Session at Neville Bonner Primary School, please register your interest by calling Reception on 02 6142 1201. Please see our school calendar for important events information!